The chapter begins with some electrical basics that become immediately important. This is the basis for using antennas to send and receive wireless signals. Our transmitter sends a current to an antenna, which radiates a field (signal), which is then received by another antenna, which is interpreted by a receiver that is sensitive to the frequencies that were transmitted. The text also mentions that a proper antenna of this type also needs a ground plane. In the illustration on page 122, we see a flat disk at the bottom of the antenna's vertical element (its radiator) that is mounted 90 degrees away from the angle of the radiator. That means they form a right angle. In the illustration I have linked to, we see a square plane. We are also told on that web page that the ground plane can be the Earth itself, a car roof, or many other large surfaces that can reflect waves that the antenna sends toward it, which gives the antenna the effect of producing additional waves, as we discussed in the last chapter. This is a positive propagation behavior effect. By the way, a ground plane does not have to be electrically grounded, but they often are. Decibels Isotropic (dBi) - The text begins with with the example of an isotropic radiator (which does not really exist), and explains that we often need to send a signal in a particular direction instead of sending it in all directions. We cannot simply amplify the power (also called gain), since that would still go in all directions. So the text tells us that an active gain (increasing power to the antenna) is not effective in this case. The solution uses a passive gain: the same power is used, but it is distributed differently by using a shaped antenna, referred to in the text as a high gain antenna. Examples would be dish antennas and multiple element TV antennas. Decibels isotropic is the measure of the passive gain of a high gain antenna compared to that of an isotropic antenna under the same conditions. The high gain antenna will send a signal farther than the isotropic antenna, so the signal strength of the high gain antenna is compared to the signal strength of isotropic antenna at a distance they can both reach. Decibels Dipole (dBd) - First, we need to understand that a dipole antenna is often shaped like the letter T. They don't have to have this shape, but it illustrates their main characteristic. Power is applied to the base, it flows to the junction of the vertical and horizontal parts, where the signal is strongest, and then fades out to end of each of the horizontal parts. The image below from Wikipedia shows a signal being sent into a dipole antenna that is half as wide as the wavelength of the frequency being used. omnidirectional antennas - This is the simplest kind of the three antenna types discussed in this part of the chapter, but the text has discusses three factors about them. horizontal or vertical coverage - The text tries to tell us that antennas are typically deployed as vertical rods, and the signals from them tend to radiate as horizontal waves, 90 degrees away from the orientation of their antennas. The waves do radiate vertically as well, but to a lesser extent. This is important to know when planning the deployment of an antenna. If it is supposed to service devices on floors above and below it, the antenna should be deployed horizontally to produce the best results for its vertically deployed users. In practice, it is better to have WAPs on each floor of a building, rather than have them try to cover multiple floors. polarization - As noted above, the radiating element of an antenna is at right angles to the most effective part of the waves it radiates. Waves follow a plane that is at right angles to the radiator. That plane is the plane of polarization. 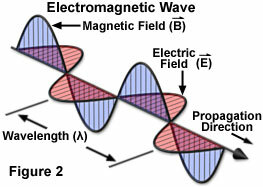 In the illustration above, we can say that the magnetic field of the illustrated wave is polarized vertically, and the electric field of the wave is polarized horizontally. When we talk about electromagnetic waves in general we do not separate the two components, and we say that the wave is either polarized vertically or horizontally, at 90 degrees from the orientation of the radiator. In general, we would like the orientation of the receiving equipment to match that of the transmitting equipment. antenna diversity - The text explains that many wireless access points have two antennas so that they can receive each signal more than once, even in conditions in which there is no secondary copy of the signal due to propagation behaviors. In most cases, the signal received by one antenna or the other will be stronger than the other, allowing the WAP to select and use that stronger signal. This selection process is called switching, which is unfortunate, since that word already has a meaning in networking. Antenna diversity works in the reverse direction as well: if one antenna has been selected as better to receive signals from a given device, the WAP can choose to use that antenna to transmit to that device. Some access points have multiple antennas that they use for different frequencies. See the discussion of MIMO below. semidirectional antennas - Instead of transmitting in a full circcular pattern, a semidirectional antenna will transmit across a half circle (a semicircle) or less. The design and construction of the antenna will determine what angle its transmitted waves will cover. The illustration below is a Yagi antenna for TV reception. Its design makes it more effective for receiving signals from a particular direction. In this case, from a transmitter to the east northeast, assuming we are looking north in the photo. highly-directional antennas - This kind of antenna will transmit across the greatest distance, all other factors being equal. They are often dish antennas, as noted above, and they require more care to focus them on their intended source or target. Each of these types of antennas is illustrated and discussed on this web page. The text changes topics to discuss coverage patterns for antennas. antenna radiation chart - This is a polar graph, showing how an antenna radiates its signal. This kind of graph is circular, as shown on pages 132 and 133. Each location on the graph can be described by its distance from the center, and by the number of degrees it is away from the 0 degree line. Antenna location - The antenna is located at the center of an antenna radiation chart. degrees - This chart divides a circle into 360 degrees, which is the most common way of looking at a circle. circles in the graph - It is common to show circles in the graph that correspond to distances at which the signal strength drops significantly. In the examples in the text, we should read that the signal strength has fallen to 0 at the outermost circle, and the numbers on the inner circles are the signal strength remaining (in dB) at those locations. In the link I have supplied, another author show us a different way to look at similar data. He is showing us the percentage of signal remaining at each distance in an asymmetric pattern. Azimuth chart - The chart on the left on page 133 is an azimuth chart, as is the second chart on the web page at the link above. An azimuth chart shows the signal pattern when viewed from above. This is the most useful chart for showing the most effective locations for receiving signals from this antenna, in terms of horizontal distance from the antenna. elevation chart - The chart on the right on page 133 is an elevation chart, which shows the signal strength from an antenna when viewed from one side. This kind of chart shows the strength of a signal in terms of vertical and horizontal distances from the antenna. In the example in the text, the two charts are meant to represent the coverage shown by the 3D graphic above them. It is tempting to rotate this chart in your mind to envision the 3D graphic, but that would not be correct in the case of an signal pattern that is not symmetrical. In that case, several elevation charts might be more informative. beamwidth - This is a measure of an effective part of the radiation pattern of an antenna. It assumes that there is a most powerful direction of radiation, so this applies more to any sort of directional antenna. From the most powerful part of the signal being sent, the signal is measured to each side to find the places where there is a reduction of -3dB, which is a 50% reduction in signal. These points mark the useful beamwidth for the signal. As the text states, this measurement can be taken on an azimuth or elevation chart. Fresnel zone - The text first discusses line of sight, which is a related concept. A visual line of sight means that you can see something. An RF line of sight means you can receive a signal from something, which is different because of signal diffraction, scattering, etc. Surrounding an RF line of sight are several theoretical Fresnel zones. Imagine them as a series of long balloons. The first zone encloses the line of sight. The second zone encloses the first zone, and so on. Signals passing through a Fresnel zone will be out of phase with the original signal. Signals passing through each higher numbered zone are more out of phase with the original signal than those in the next lower numbered zone. The text discusses obstructions in the various zones, but the bottom line is that we are better off if the RF line of sight to the target is clear. The text offers a list of suggestions for improving reception, but they all come down to raising the transmitter and receiver above whatever is in the way, or clearing away the obstruction. The next topic in the chapter is MIMO (multiple-input multiple-output). The text gives us a little background on the general subject first. IEEE 802.11a, b, and g specifications all say that a device can only receive or transmit on one antenna at a time. This is why a device using one of those protocols that has antenna diversity must choose an antenna to use when it receives on both of its antennas. IEEE 802.11n uses a multiple-input multiple-output (MIMO) system. A MIMO system has a separate processor and radio for each of its antennas, as shown in the diagram on page 137. Each separate combination of a processor, a radio, and an antenna is called a radio chain, whether the system uses SISO or MIMO. Spatial Diversity - The main point is to use multiple antennas to send and to receive signals. The first benefit is that sending multiple copies of one signal from multiple antennas means each of those copies will be likely to take a different path to the receiver, and will undergo different amounts or different types of damage, increasing the odds that one will be better than the rest. The second benefit is that sending out multiple copies at once makes it more likely that the signals can be interpreted together, and that a larger portion of it will be understandable. Spatial Multiplexing - This technique sends different data streams through multiple radio chains at the same time, which increases throughput when they all can be received and reassembled correctly. The text gives us a notation used to understand how spatial multiplexing is implemented on a given device. Example 2x3:2 would mean that the device can use up to 2 antennas to transmit, and it can use up to 3 antennas to receive, and can handle up to 2 data streams at once. I have added the colors for reference. Maximal Ratio Combining (MRC) - Most mobile devices only have one antenna. When a signal from such a device is received by a MIMO device, the MIMO device still receives multiple signals due to propagation behaviors. The MIMO device adjusts the various signals for phase and amplitude, and combines them into the best possible copy. The method used to do so is called Maximal Ratio Combining. Transmit Beam Forming (TxBF) - The short form of this item is that a transmitter can change the beamwidth or the direction of signals to avoid signal interference. TxBF is the method it can use to do so. The text discusses several topics dealing with antenna installation. The section begins with the observation that 802.11n antennas are all internal, which makes the spacing of those antennas follow a rule that says they need to be more than half a wavelength apart. So how far is that? The text tells us that the wavelength for 2.4 GHz is 12.5 cm (4.9 inches) and the wavelength for 5 GHz is 6 cm (2.3 inches). Nice to know. A wireless access point is commonly located as close to the middle of its intended coverage area as possible. This is sometimes mitigated by the practice of mounting it high on a wall or on the ceiling to avoid obstructions and to prevent easy theft. The text recommends that we should never place any electrical equipment, including access points, in plenum space. The possibility of fire in a plenum is unacceptable. Some systems will need an amplifier added to bring the signal up to the power level the FCC allows. Amplifiers come in two types for these systems: unidirectional amplifiers boost power at the antenna, and bidirectional amplifiers boost power either at the antenna or at the device that connects to the antenna. Some systems will need an attenuator added to bring the signal down to the power level the FCC allows. Attenuators can be fixed-loss or variable-loss, but only fixed-loss attenuators are allowed on WLANs by FCC rules. Use connecting cables that are short whenever possible, and make sure they can handle the power levels on your system. Use as few RF splitters as possible. They are not allowed on 802.11n systems. The text recommends installing lightning arrestors, but warns that they do not protect equipment from direct lightning strikes. A lightning arrestor only protects equipment from the surge of RF energy that would be caused by a nearby lightning strike. The last topic is about more antenna measurements. link budget - The text tells us that this term refers to the sum of the gains and losses in power between a transmitter and a receiver. We are give a list of factors in this concept, but we are not given an equation to use. This discussion on Wikipedia shows that it is as the text implies, a simple addition and subtraction problem. Voltage Standing Wave Ratio (VSWR) - This measure compares the voltage that we put into a system to the voltage that comes out of it, typically at the antenna. It is expressed as a ratio, and the ideal ratio would be 1:1. Higher ratios like 2:1, 4:1, or 10:1 show a mismatch in the components of a system, and may result in reflected signals or burn out of components.